One of my favorite things to do is to find cool and historic locations to photograph. I love to read and hear about the old history of the historic sites. I really enjoy looking at the old images of the historic builders, landmarks, and other historic sites. 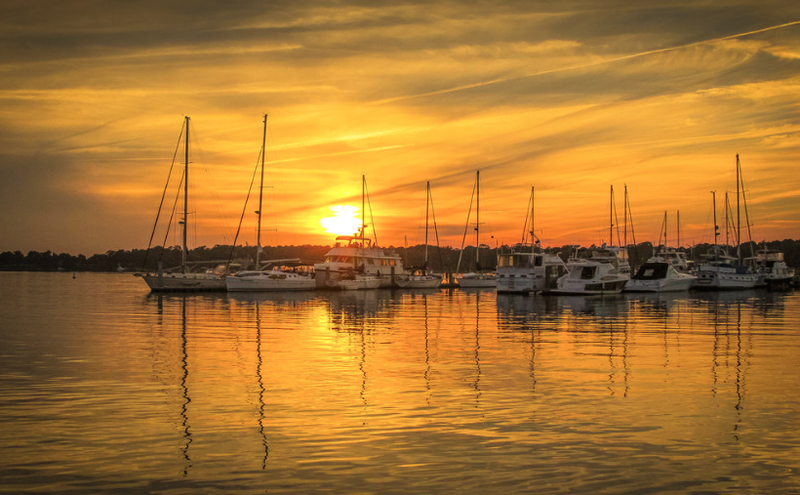 Luckily for me, I live in Jamestown North Carolina and I have a few sites that are easy to access and photograph. One such historic location is the Jamestown Library. The Jamestown Library is a unique building that you definitely don't see too many like it today. In 1907, the location of the building was the site for the first rural high school in the area. The former high school was unique back in the day. It was the first accredited rural high school in the state of North Carolina and was the first of its kind in the country. The Jamestown Public School Building was built over 100 years old, back in 1915 after a tragic fire destroyed the first building. The new building was utilized as a high school until 1959. During that year, the Ragsdale High School was built and replaced it. After the building was no longer used as a high school, it became a middle school and it was called the Millis Road Elementary School until 1982. After 1982, the alumni from the town renovated the building and converted it into the Jamestown Public Library in 1988. Today, the building stands as a proud symbol of the rich historic history of the town of Jamestown. Recently, I visited the Jamestown Public Library and did a photo shoot of the building. It was very nice to be able to walk quietly around the historic property and admire the building, it's history and the unique architecture. Below are a few photos from my photo shoot. If you love the history of old buildings in small towns you have to visit the Jamestown Public Library. It is a great building to visit, read about its history, and most of all photograph. I suggest if you come to photograph the building and the grounds plan to do it in the Spring when the site is full of color. Winter is also a great time to photograph the building if the area is covered in snow. The best day to visit the building in on Sunday's. The site is closed and you pretty much have access the site all to yourself. So, enjoy it. To see archive photos of the library building visit "Jamestown Public Library". To see a video of my photo shoot visit my "Roger Younce Youtube Channel". Today I wanted to have a little fun and do shot some images with a lens that I haven't used in a while, but really love to use. I wanted to go out on this beautiful day in Jamestown North Carolina and shoot some images with my old trusty Canon EF 1.8 50mm lens. I really had no real subjects in mind for my trip into town. However, I wanted to see if I could capture any nice photos in my little town. My goal was to find some images within a 5-mile radius from my home. This time of year the trees are starting to bloom and some beautiful flowers are starting to show up. So I wanted to concentrate on those types of subjects for my images. Anytime I shoot with my 50mm lens my main objective is to find subjects with a lot color. I love shooting with the 50mm lens because of the availability of light and the sharpness of the images the little but powerful lens gives me. Today was a pretty nice day to do a little photography. The natural light was not too harsh and there was some cloud cover. I ventured out to see if any of the local parks in Jamestown had any colorful subjects to shoot. My main objective was to locate some flowers. I wanted to share a few images of my trip today. I was pleased with the images because I did get what I was after; color and clarity. Every photographer should have a nifty-fifty lens in their bag. It is one of the most useful lenses a photographer can own. Yes, the lens can make a photographer work a little harder to get a shot, but that is fine with me. My 50mm lens has no stabilization and no zoom. So it requires me to really think about my shots. I had a lot of fun shooting some nice but simple images today. I got the opportunity to put my old trusty 50mm lens on my new Canon 80D camera and capture some nice images. What a great way to enjoy a beautiful day. One of my favorite places to visit is the Blue Ridge Parkway in North Carolina and Virginia. I am pretty lucky to have access to both states. For me, the drive to my nearest access to the park is about two hours away. Each year I look forward to visiting the Parkway even though I see a lot of the same locations. A lot of people may find it crazy that I go back the same locations and photograph the same sites. For me, each visit is different depending on the time of the year. This year was different for me because I purchased a new lens and a new camera and of course, I had to test them out at the Blue Ridge Parkway. The parkway was a great place to test my lens and camera. I have access to beautiful mountains, landscapes, valleys, and historic sites throughout the Parkway. I wanted to test out my new Canon 80D and see how well the dynamic range was on the camera. I had read the dynamic range was very impressive. I was very impressed with some photos I took while on my trip. My first stop on my 9 hour trip to the Blue Ridge Parkway was the Mabry Mill in Virginia. The Mabry Mill is one of the most photographed locations on the entire parkway. Thousands of visitor from all over the world viist the Mabry Mill each year. Below is a little history of the mill. Around 1905 Ed and his wife Lizzie Mabry set in motion actions to realize the dream of their own gristmill. With the help of a neighbor, Newton Hylton, they built the gristmill, waterwheel, and water supply flume system with hard work and hand tools. By 1908 the gristmill was in operation and people from as far away as eight miles were bringing their corn to be ground. Also by this time, Ed Mabry was ready to move on to his next project which was to build a sawmill on the left side of the gristmill. While Ed was busy building the sawmill, Lizzie took over the milling duties at the gristmill. Many said Lizzie was the better miller of the two. There was a problem though. Because the streams used to supply water to the mills were small, there was not enough needed water power. Due to the lack of water power, the process of grinding the corn at the Mabrys’ mill took longer than at some of the other nearby mills. Mills with plenty of water power would at times grind too fast. The resulting friction turned to heat which would then burn and scorch the cornmeal leaving it tasting bitter. Because of the low water power problem at the Mabrys’ mill, it was known as a slow grinder. Due to this problem, the Mabrys could not grind the corn fast, but they also never burned or scorched the cornmeal which resulted in some of the best tasting corn meal around. This news spread fast which brought many loyal customers to the Mabry’s little mill. Soon the sawmill was finished and Ed began to build a woodworking shop on the right side of the grist mill. This shop had a double-bladed jigsaw, a wood lathe and a tongue and groover all run by the water-powered waterwheel. This completed the gristmill complex with the sawmill, gristmill and woodworking shop all attached. I really enjoy photographing the mill and try to visit each year. Last year, I got a take a great photo of the mill in the winter and frozen ice was on the wheel of the mill. This year I got a great shot in early Spring. The mill opens up in later April each year. For photographers, photographing the mill can be a challenge due to crowds each year. It is good to plan your photo shoot at the mill early in the year or after late October. In late October, the mill will be closed but it is easier to photograph the mill. I was able to get a couple of other images with my new camera that shows off the dynamic range of the Blue Ridge Parkway. Since it was Easter weekend I photographed this very colorful display that was positioned along the roadway. I had to stop and get the image. Last year I stopped in October and the display was covered with hay and pumpkins. This year's display featured some very colorful displays for Easter. Another great image was an image of the blue ridge mountains. I found this image fun to shoot. I wanted to capture the mountain range and the lone tree in the foreground gave the image a dramatic feel to the image. Many of the trees have so much character and a photographer could spend a week exploring just the trees along the parkway. I love the blue colors of the mountains and this photo demonstrates why the Parkway is so special. I had a great time testing out my new camera and telephoto lens. I always enjoy visiting the parkway because every visit is unique. If you get a chance to visit North Carolina or Virginia, you have to take a day or two to stop and photograph the Blue Ridge Parkway. It is must-stop for any landscape photographer. We have all heard the motto that "it is not all about the reaching a goal that is most important, but it more about the journey". When it comes to photography and wanting the capture a nice photograph of a location you have never visited that motto can be a great one to remember. Recently, I visited a state park in North Carolina that I had never heard of before even though I from North Carolina. The state park gets very little publicity, but my wife read that the park had a waterfall as one of it's major attractions. Those that know me know I really cannot resist photographing a new waterfall. With the information I got from my wife and the photos she found of the waterfall I thought we would take a road trip and check it out. My objective was to get a new image of a new waterfall and add it to my collection of photos of waterfalls from North Carolina. South Mountain State Park in North Carolina was not a far from my home. The trip was only going to take about 2 hours from my home. According to what my wife and I read about the park was the park offered clean campsite, hiking trails, a beautiful flowing creek, and best all the water that is called, "High Shoals Falls". Finding the park was not that easy and took my wife and I deep into the back roads of North Carolina. On the back roads, we saw large farmlands, old country homes, and nice roaming pastures. I was actually surprised that the state park was so far off the beaten path and at times wondered if we were lost. After about 2.5 of driving, we finally made it to the state park. When we entered the park we found the park to be rather nice, clean and there were very few visitors. We kind of planned it that way. We decided to visit the park on a Monday to avoid the crowds that we read could be large on the weekends. We made the right decision to visit on a Monday. Once we entered the park we entered a very nice visitors center and got directions to the waterfall. The waterfall was only 2 miles from the visitors center. We had read the hiking trail to the waterfalls was only one mile, one way. We also read the trail was flat, and it was a moderate trail. Well, the trail was one mile long but the trail was not flat or moderate. The first part of the trail was flat, but about halfway into the hike, the trail became a little more difficult. The trail had large roots from nearby trees near a nice flowing and beautiful creek. The trail had some steep steps that had to be taken to get to various parts of the trail, and more importantly, the last quarter mile of the trail consisted of steeper steps and large boulders to confront. As we got closer to the base of the boulders my wife decided she would stay by the creek side and enjoy the nice weather and listen to the flowing water from the creek. She was the smart one. I decided to venture to the top to get a photo of the waterfall that was not visible from the location where I departed from my wife. My guess was, I was not too far from the waterfall. I was wrong. Once I departed my wife, began the short but tiring journey of climbing steep stairs and rocks to get to the summit. On my way to the top, I passed a few people. I passed two young girls on my way to the top (or should I say they passed me). I also had an older gentleman pass me that was coming done from the falls. He had a great deal of difficulty coming down the step stairs descending from the upper falls. I knew the hike was very difficult for him and he stated he had a lot of physical issues. Walking was one of them. I had a lot of respect for the old geezer. He could barely walk but he did not let that stop him from venturing to the top to snap a photo or two of the waterfall even though he had taken the trip many times before. Once I reached the top and beside the High Shoals Falls, I was impressed by the amount of water from the falls. Recently, the area had received a great amount of rainfall. So the volume of water was impressive. However, I was disappointed in the view. I found out very quickly that there was no real way to get a good composition for my shot. Another issue was the direction of the sun. I had to shoot directly into the sun and that was not going to work at all. There was a small platform to work from and I was continually dealing with mist from the waterfall. I did take a few images but after I reviewed them they were not worth keeping. After being a little disappointed I packed up my gear and began my journey back down the trail to meet up with my wife. Coming down the trail was a little tricky and it was a place that one would not want to fall, sprain an ankle, or break a leg. As I came down the trail I began to think about the old man I passed and wondered if he made it down okay. I did locate him resting on a boulder 30 minutes after I originally met him. He was taking his time and being careful in his decent. I could tell it was not his first rodeo. After meeting up with my wife, I informed her that I did not get a good shot of the waterfall. Then I started thinking that the trip was not a total waste of my time and getting a special image was not that important. What made the trip special was I got to enjoy an adventure of visiting a location that I had never heard of before. My wife and I got to spend quality time together enjoying a beautiful day. My wife got to do a little mediating by a nice flowing creek and enjoy some private time in nature. Those in photography, including myself, sometimes get so hung up in getting that "special image" that we can work with and share with others. But, the image is not what made the journey membeable. What makes a journey special is the what happens throughout the adventure. Sometimes is best to go with the flow and enjoy the experiences, sights, sounds, and challenges from an adventure. If one is too focused on getting a great image, one can miss out on what is most important and it living in the moment. If you get a chance to visit South Mountain State Park in North Carolina, enjoy the park. It as very nice campsite, a beautiful stream to fly fish and hike by, numerous hiking trails, and most of all a nice waterfall if want to push yourself to the top. Just remember to enjoy the journey. One of my favorite nature photography photo shoots is the amazing Angel Oak Tree. However, photographing the tree can be a challenge. I have been to the tree twice and each time I learn something different when it comes to trying to photograph the amazing tree. One of the biggest challenges is dealing with the amount of visitors the tree brings in. On my last visit I had the deal with about 20 to 30 visitors surrounding the tree. The tree is also surrounded by ropes and signs. Of course those items can be removed with a little post-processing software magic. I can understand why they want to see the tree. It is amazing and a photo does not do it justice. It is also important to plan accordingly in what type of gear you need to photograph the tree. It is important to bring the proper lens, filters, and a good sturdy tripod to get a nice sharp image of the tree. Planning is also important when to comes to the right time of day to visit. The bright sun can really blow out your image because the sun is usually an issue in early morning and there is no cloud cover. 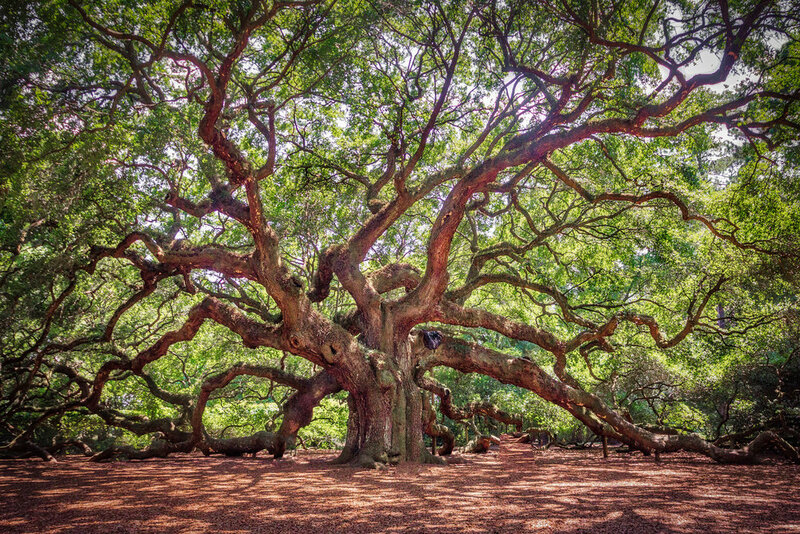 The Angel Oak Tree is located on Johns Island in South Carolina. The tree is an amazing tree that has been photographed by many talented photographers and is must see if you visit the area. The tree is estimated to be between 300-400 years old, the tree towers 65 feet high and has a circumference of 25.5 feet. Its area of shade is 17,000 square feet and its largest limb has a circumference of 11.5 feet, and a length of 89 feet. If you love nature you have to see this amazing tree. If you are in South Carolina near John's Island you have stop by and see this amazing tree. There is no admission and it is well worth the stop to see the amazing and historic tree. My version of the Angel Oak Tree is available in my store and the image is available as a metal or metallic paper print. To order you print visit "Angel Oak Tree". To see a larger image if the tree just click on the image. As a photographer it is always nice to have some type of plan when you visit a location. However, not all adventures go the way one plans. In some cases, a photo shoot can turn out to be a waste of time and no nice images are taken or the ones that are taken are terrible. But, there are those times when what one would consider a bad location can offer some amazing results even though the plan falls apart. Take for example, my recent trip to the Blue Ridge Parkway in North Carolina, near Asheville. My wife and I decided to get up early on the last day of our four day stay in Asheville NC and stop by a location that I had never been to before, Craggy Gardens. My objective was to photograph some flowers located on the top of the mountain at the Craggy Gardens and take a few images of the beautiful Blue Ridge Mountains mountain range. At the start of my trip it looked like the weather was going to be perfect. As we traveled North on the Blue Ridge Parkway the weather looked great with partly cloudy skies. There were some beautiful low line clouds over on the tops of some of the lower mountains. As we headed North the weather begin to change. The clouds and winds started to become an issue as we got closer to the mountain where the Craggy Garden was located. I began to think the trip was going to be a total waste of time. Visibility was terrible. When I arrived at the Craggy Garden Visitor Center I was hoping to get some information on the best places to photograph the well known flowers in the area. The problem was the visitor center did not open until 10 am. We arrive at 9 am. As my wife and I sat in the car the weather seemed to be getting worse. The mist and the winds began to pick up and visibility was pretty bad. I could see about 20 yards in front of me. I wanted to venture out to see if I could find any trails that might lead me to the Craggy Garden overlook even though I knew I would not be able to get an image of the area and mountain range because of the poor weather conditions. As I ventured out to explore the area I found a trail that looked interesting and I wanted to find out where it led. Before entering the trail head and the forest I was aware that I did not bring my camera. My plan was just explore the area in case I wanted to come back and revisit the area when the weather was better. I felt that there was no way I would be able to find anything interesting to photograph. I entered the trail with really no real expectations. As I entered the trail head I realized that the further I hiked the more interesting the location became and how the mist and clouds began to offer some interesting views of the location. The location became misty and moody and I became more excited about the location even though I forgot all about the flowers I intended to photograph. The more I explored the trail the more I knew I had found something special. As I continued my hike I realized I had to return to my car and get my camera and return back in to locations and get as many images as I could before the scenery changed. I am so glad I did. When I returned to the trail I was so lucky to be the only one on the trail. I had the whole misty and moody location to myself. Below are two of my favorite images from my visit to Craggy Gardens. The moral of my story is never give up when you think you have nothing to photograph at a location. There is always something to photograph. If one is lucky, any unplanned or accidental adventure may provide a great image or two. I am so glad we took our trip to Craggy Gardens, It was windy and cloudy, and the weather did not cooperate but that is what made the adventure so cool. For me, the weather was perfect. Note: Both images are available for purchase as a metallic paper or metal print at "The Store".